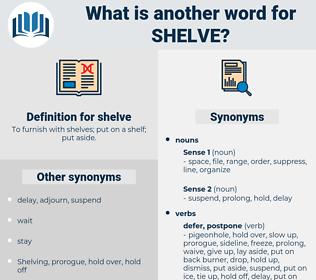 What is another word for shelve? 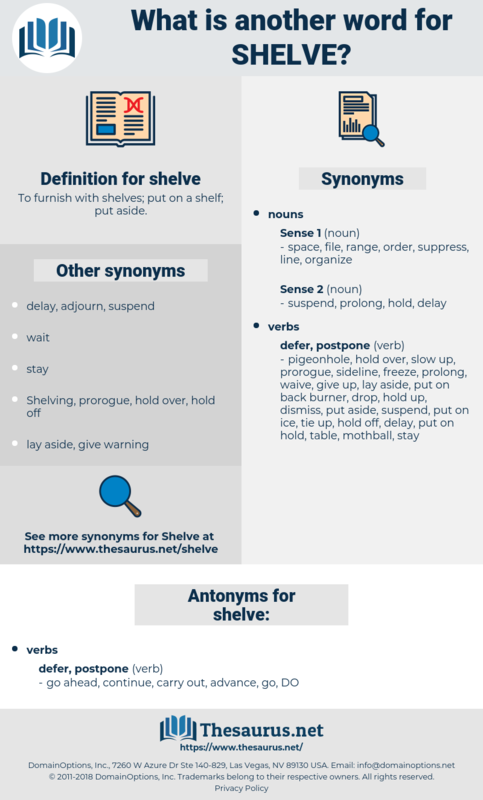 To furnish with shelves; put on a shelf; put aside. giving or her walking papers. suspend, postpone, classify, adjourn, categorize, archive, dismiss, put, stay. go ahead, continue, carry out, advance, go, DO. The idea that they, or the Irish Reform Association in general, and I myself in particular, were actuated by a desire to shelve Home Rule by substituting a measure of administrative reform, is pre - eminently absurd. Thus the effort of Pitt and his colleagues to shelve the Duke of York was foiled. solvay, soil pipe, schoolboy, sylph, swell up, shelvy, slave, slab, slav, sulfa, shelf, scale leaf, salve, seal off, sloop, scalp, skylab, sleeve, selloff, silvia, slavey, sell up, social phobia, sell off, scale up, slob, syllabub, school phobia, selva, swallow up, scallop, syllabify, ski slope, self, saliva, sloppy, sick leave, slop, slip, sleep off, slip by, sea wolf, slap, sea scallop, salvia, solve, solfa, salpa, slub, shlep, slope, slippy, slow up, sulpha, salp, shelfy, slipway, sylva, slip away, silva, sleepy, slaphappy, scollop, sillabub, salvo, sclaff, slip up, sexual love, slip-up, slip off, sleep, schlep, slap-up. put, pose, place, lay, position, set.